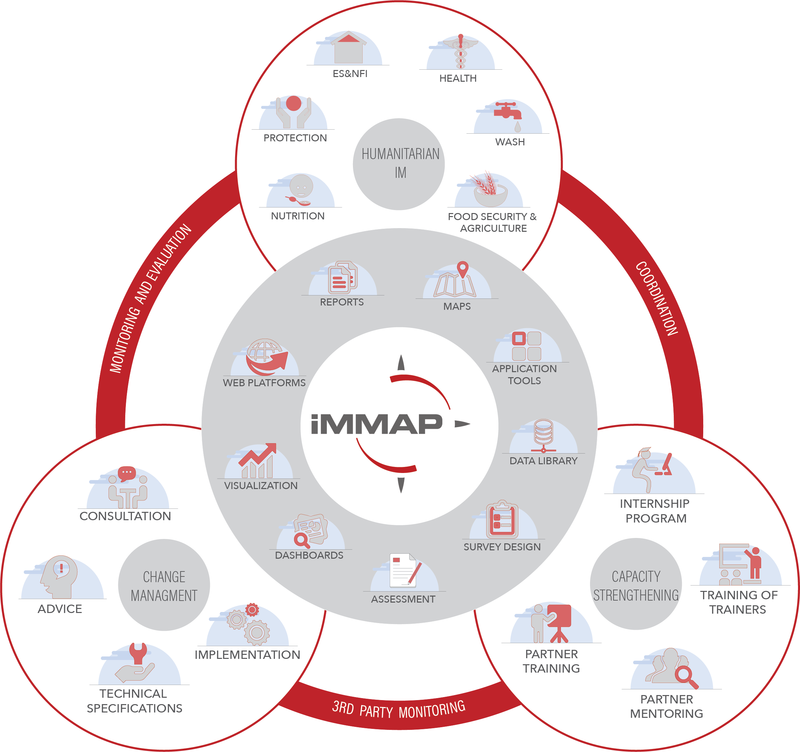 iMMAP is an international not-for-profit organization that provides information management services to humanitarian and development organizations, enabling partners to make informed decisions that ultimately provide high-quality targeted assistance to the world’s most vulnerable populations. We support humanitarian actors to solve operational and strategic challenges. Our pioneering approach facilitates informed and effective emergency preparedness, humanitarian response, and development aid activities by enabling evidence-based decision-making for UN agencies, humanitarian cluster/sector leads, NGOs, and government operations. iMMAP has been at the forefront of information management support for humanitarian clusters (UN and International NGOs): Logistics, WASH, Health, Protection, Education, Nutrition, Camp Management, Protection, Food Security, and Gender-Based Violence. iMMAP's mission is to harness the power of information to facilitate evidence-based decisions to improve people’s lives. iMMAP turns data into information and creates knowledge for decision-makers operating in development contexts, situations of violence, post-disaster, and conflict recovery. iMMAP envisions a world where no one suffers due to lack of access to timely, relevant and reliable information that has the power to transform lives. Evidence-based information: iMMAP enables evidence-based decisions and practices that lead to targeted interventions that are cost-efficient and sustainable. Data Integrity: iMMAP safeguards the accuracy and consistency of data throughout its lifecycle. We implement measures to ensure iMMAP remains a reliable partner for evidence-based information and decision making. Information sharing: iMMAP promotes appropriate data sharing among humanitarian and development partners to promote better planning and enable innovative solutions to meet the needs of the most vulnerable populations. Lead transformation: iMMAP is committed to staying at the forefront of information management to solve operational and strategic challenges of our partners. On Standby:iMMAP’s experience in emergency settings has shaped its services to respond better to the needs of its partners. We remain on standby to assist our partners to fill the gaps in information management and emergency coordination. Respect: iMMAP fosters an environment that promotes respect for populations in need of help and contributes to upholding their dignity. We offer our partners the full spectrum of information, knowledge, and change management services, including capacity strengthening, covering sectors and thematic areas such as food security and livelihoods, agriculture, population movement, urban profiling, health, coordination, disaster risk reduction, market and value chains, and mine action among others. We partner with organizations to provide cost-efficient and more effective services based on informed decision-making. Our cost-saving approach enables humanitarian aid and development organizations to reach more people and provide high-quality assistance that impacts the wider population. Direct Support: Provide solutions and strategies to support sectoral and organizational specific needs. Standby Partnership: iMMAP maintains an active surge capacity Stand-By Partnership Program with eight United Nations agencies: OCHA, WFP, FAO, UNICEF, IOM, WHO, UNHCR and UNDP. iMMAP has proven its ability to support emergency response efforts across multiple geographic locations throughout Eastern Europe, Africa, Asia, the Middle East, and Latin America. Project Based: We provide services through cooperative agreements and direct grant support. iMMAP has a diversified donor base. Our donors include the US Department of State, USAID/OFDA/FFP, CDC, DFID, SDC, WFP, WHO, UNICEF, UNHCR, IOM, European Commission (ECHO), and the World Bank.